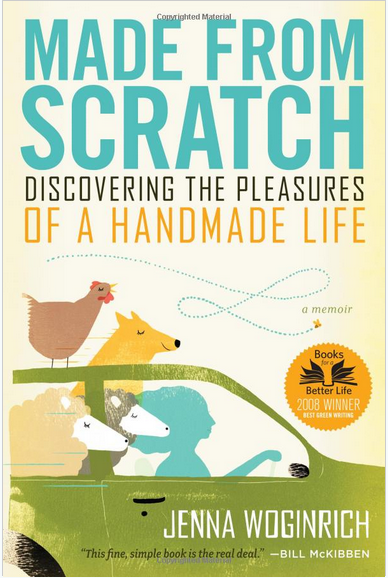 Jenna Woginrich’s Made from Scratch: Discovering the Pleasures of a Hand-Made Life is the most enjoyable and accessible of the living-off-the-land books I’ve read. Admittedly, I have not made a thorough study of the genre, but I’ve read several (This Organic Life, Animal Vegetable Miracle, The Omnivore’s Dilemma and a few others) and Woginrich manages to convey both the joy and sense of accomplishment that comes from growing food, raising animals and living more frugally, as well as the real responsibilities that come with living in a more self-reliant way. And, she accomplishes this without being pedantic or glossing over the complexities inherent in the task. Here’s the story: Woginrich graduates from college and works as a graphic designer, first in the mid-South, then in northern Idaho. Along the way, she decides to tread lighter on the world and be more self-reliant. That decision prompts her to rent a farmstead in Idaho, where she learns how to garden, bake bread, keep chickens, bees, and rabbits, sew, knit, and reuse and recycle whatever she can. The book is an homage to doing daily tasks yourself. Woginrich never hides her enthusiasm or her ignorance, and she addresses — sometimes eloquently — the consequences of her mistakes. An experiment in beekeeping, for example, ends in disaster for the bees twice — once when she forgets to unpack the queen bee, leaving her bees milling around aimlessly until they die and again when a hungry bear attacks and destroys her hive. Throughout her journey, Woginrich seeks advice from more experienced hobbyists, and along the way gains friends who give both Woginrich — and her readers — information on how to live more self-reliantly. I have no experience with bees or chickens but I’ve gardened a lot, baked my share of bread, and know my way around a sewing machine. In each case, Woginrich gives solid advice for beginners and suggests ways to start learning these skills that will most likely result in success without an excessive outlay of cash. Made from Scratch is a short book with a good resource section at the back. If you’re looking for inspiration to learn some new skills, you won’t find a more accessible guide than Made from Scratch.